Recently, someone asked us what could they expect when visiting our hemp farm. This was a quite surprising question! Because we thought that all the information we could provide about our tours, tastings, workshops, and courses, had been given in different ways through our webpage, facebook, instagram and twitter. However, the query made us wonder about your experience when you visit us. Obelisk Farm is a hemp farm but what else can you hope to experience when you visit us? Let's start with the directions to the farm, when you arrive at Obeliškas village you will see a sign "Obelyshky" and our wooden "Obelisk Farm" sign. You should follow the signs and you will be at the farm in around 3 minutes by car and 5 minutes by bicycle. Upon arrival, you can park your car or bicycle in the parking spaces available. Andris will be there to warmly welcome you. Your hemp activity (tour, tasting, workshop or course) starts at this moment. After a brief introduction to hemp and the work, we carry out here at the farm, you will be invited to enter our hemp labyrinth (as we like to call it). You will have the chance to see up close our hemp plants, to smell it and to feel it. This is an unforgettable experience according to many of our previous guests. Andris is most of the times the "main" host although Gabriela and Fredis sometimes also jump in and become "host assistants". Given the fact, that we are a family run farm, everyone is happy to participate in the daily farm activities in their own way. With reference to children, our farm is naturally a family-friendly place! Moreover, children under the age of 12, enter free of charge. We have several activities that you can choose from. All of them, as we mentioned before, are meant for you to learn about hemp and find ways to integrate this extraordinary plant in your daily life. If you would like to have a short excursion you should definitely join our hemp tour. A free tasting of our hemp tea is always included in the tours. You will be able to drink as much as you want! And if you would like to bring some tea with you, our hemp shop is the place to visit! 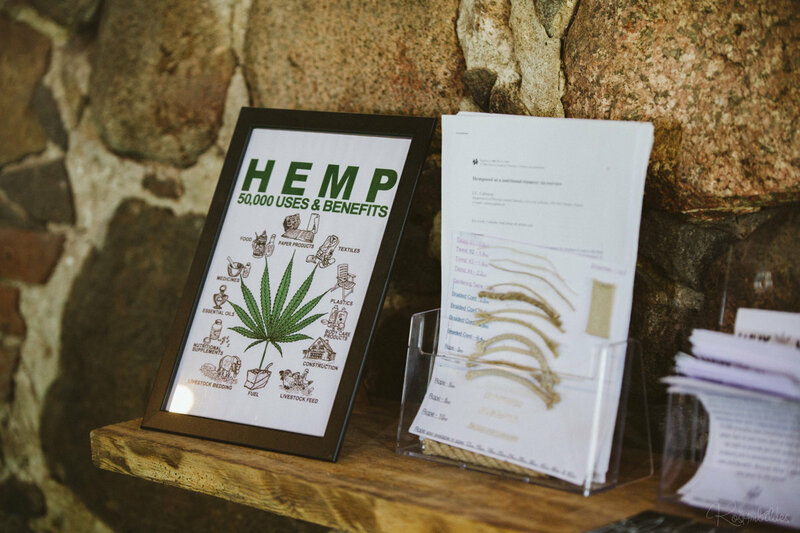 On the other hand, if you want to expand your knowledge regarding hemp and have a hands-on experience you should choose one of our workshops available on the hemp school. At the moment, we have 2 workshops available: hemp paper and hemp as a building material. In the hemp paper workshop, you can learn how to make your own hemp paper. We will take you through all the steps until you get your own handmade piece of hemp paper which you can take home after the workshop. The hemp as a building material workshop seems to be a great choice if you are interested in the very basics of hemp building. If you would like to get a deep understanding of the issue, we advise you to take part in one of our hemp building courses. Furthermore, if you would fancy trying out some of our hemp products, you should certainly choose the hemp tastings. Besides tasting hemp tea, peanut butter, protein, oil, bread, seeds and our hemp bar, you will also witness a live demonstration of how to make hemp milk. By the way, all activities can be combined. So, let's say you want to take a tour around the farm and also have a tasting (which is actually what many of our guests do) go for it! Whatever combination you feel like it suits your needs/expectations just let us know. All in all, Obelisk Farm offer is made for you to explore as much as you want the hemp plant. We always hope that after your time here you will be more informed about cannabis, it's uses and benefits. And that, the journey we designed will encourage you to incorporate hemp in your daily life. Until the end of August, we will be open every day but from the 3rd of September only on the weekends. So, please make sure to book in advance so we can arrange the best day and time for your visit! We will be expecting you! Can hemp save the family farm?